A new era begins for Indiana football, as the Hoosiers will play their first game under new head coach Tom Allen, who took over for the recently fired Kevin Wilson. Allen had a very successful stint as Indiana's defensive coordinator, and the adjustment should be quick. However, the Hoosiers will not have an easy opponent, as the disciplined and methodical Utah Utes will be on the opposing sideline. Indiana had a high-flying offense under Wilson, and they should continue with that spread, up-tempo attack. Quarterback Richard Lagow put together an impressive 2016, finishing with over 3,000 yards passing and showing decent running ability. He will be joined by 1,000-yard rusher Devine Redding and plenty of weapons at receiver. The Hoosiers will have to play smart and not turn the ball over, as the Utes capitalize off turnovers as well as anybody in the country. Defensive back Marcus Williams is a ball hawk in the back, and physical D-Linemen Lowell Lotulelei should apply plenty of pressure on Lagow. Utah doesn't quite have the explosive offense that Indiana possesses, but they have proven they can move the ball, thanks in large part to back Joe Williams. Williams announced retirement late in the summer due to injury issues, then returned after a few weeks and has been terrific since. Williams has run for 1,185 yards on the year, eclipsing 100 yards five of the last six weeks, with the highpoint being a 332-yard showing in a win over UCLA. Indiana has proven to have a solid rush defense, but Williams has proven he can dominate even against legit defenses (ran for 170-plus against Washington). Quarterback Troy Williams leads a pass offense that doesn't rely on big plays, but gets the job done. Athletic receiver Tim Patrick and the rest of the Utes' weapons should be enough to challenge Indiana's back seven. Overall, the game features two solid teams looking to end successful years on a high note. Indiana should be fired up in this one, but Utah is the more fundamentally sound team and has more weapons defensively. If the Utes can get enough from both Williams, they should be able to roll to a ninth win on the year. While most teams tend to improve as the season goes on, with more experience and comfortability, it has been the opposite for Texas A&M over the past few seasons. For the third straight season, the Aggies started off the year hot, rising as high as No. 4 in the first CFB Playoff Rankings of 2016 before falling flat late, ending up 8-4. They enter bowl season against a K-State squad that quietly went 8-4 and will be a tough team to beat. The Aggies do not know who will be their starting quarterback for this one. Former Oklahoma transfer Trevor Knight has put together a strong final season of college football, but suffered a knee injury in late November and his status for this one is up in doubt. If he can't go, quality backup Jake Hubenak (884 yards, six touchdowns) should be ready to go. Hubenak will face a Wildcats' defense that doesn't have any big name stars, but has plenty of experience, namely in the secondary. Long known as a pass offense, Texas A&M showed more balance this year, with a big season from young tailback Trayveon Williams. He will also be joined by explosive playmakers at wide out, such as Josh Reynolds and Christian Kirk, who will look to blow the top off the K-State defense. No matter who takes over at quarterback, those weapons should be enough to put points on the board. The key will be stopping opponents, which has never been a real strength for A&M under Kevin Sumlin. The defense was wonderful for much of the season but has struggled mightily over the past few weeks, most notably when they allowed 54 points to a struggling LSU offense. The unit has tons of talent, led by defensive end Myles Garrett (who should be playing his final game in an Aggies' uniform), but it lets up too many big plays and still struggles with play recognition. The key for A&M will be containing dual threat quarterback Jesse Ertz, who plays such a huge role for Kansas State. Ertz threw for 1,560 yards while rushing for 945 yards along with 10 scores. Along with quality veteran Charles Jones and big play threat Alex Barnes (7.9 yards per attempt), Kansas State's rushing attack can be pretty lethal. If they can make some big throws early it could soften up the Aggies' defense enough to get some consistent yardage. Another key component to the Wildcats' offense is fullback Winston Dimel, the son of offensive coordinator Dana. Dimel has only gotten 30 rush attempts on the year but has made the most of them, with 12 touchdowns. His contributions in short yardage situations should play a big role in this one. Talent-wise Texas A&M is still probably the better team, but that has not made a huge difference for this team a lot of times. With them trending down, I actually like K-State in this one, which qualifies as an upset. If the passing game can do enough and the defense holds its own, the Wildcats could the quietest nine-win team in a long time. The American Athletic Conference has established itself as the cream of the crop of the Non-Power Five conferences, and a victory by one of their elite teams (USF) over South Carolina would only further cement that fact. The Bulls have been very dangerous on offense all year long, as do-it-all QB Quinton Flowers has led the team in passing and rushing. Flowers' mechanics still aren't great and he can't always beat you solely with his arm, but his versatility is enough to give defenses big problems. Star back Marlon Mack is no slouch either, running for 1,137 yards and 15 touchdowns, while averaging 7.1 yards per rush. South Carolina's defense did see some great rushing offenses in the SEC, but even so, they could be in store for a rude awakening against such a dynamic offense. The Gamecocks have been a great story, improving from a disastrous 2015 to win six games under first year head coach Will Muschamp, despite extreme youth. A lot of that can be credited to some excellent speed and explosiveness on this offense, which kept them afloat in a number of games. Backs Rico Dowdle and agile A.J. Turner will hope to have a huge day against an inconsistent Bulls' rush defense, and receiver Deebo Samuel is dangerous. USF's pass defense is not fantastic either, and South Carolina will work hard to exploit that. However, the Gamecocks quarterback situation has been a revolving door. Senior Perry Orth began the year but has struggled, while true freshman Brandon McIlwain has also had some issues, but is still considered the quarterback of the future in Columbia. Freshman Jake Bentley has become South Carolina's leading passer, and should start this one. If he makes smart decisions, it would go a long way in helping the Gamecocks take home a victory. Head coach Willie Taggart left for Oregon, but new head man Charlie Strong will hope to keep the momentum going in Tampa. He will face a South Carolina team that should have plenty of fight, but the Bulls are the better team. If the defense can do just enough and Flowers and Mack have a big day, USF should have no issues winning this one. After such a long tenure of Frank Beamer, there was no indication what was to be expected of Virginia Tech in Year One under Justin Fuente. Yet, things have gone even better than perhaps expected, as the Hokies have won nine games and won the ACC Coastal, pushing Clemson to the brink in the ACC Championship Game. They want to end the year on a high note, but Arkansas is no pushover. A big reason for the improvement in Blacksburg for VT has been a much more dynamic offense. Signal-caller Jerod Evans is still learning, but he finished with 3,309 yards through the air and can also open things up with his legs. He is helped by one of the ACC's top receivers, Isaiah Ford, who can open up games with his home run ability. The Razorbacks' pass defense has been successful for much of the season, but Evans, Ford and even physical tight end Bucky Hodges present new challenges. For Arkansas, the key for them will be not turning the ball over. Veteran QB Austin Allen has done a great job filling in for his graduated older brother Brandon, but has also cost Arkansas many times with poor decisions. Virginia Tech has plenty of ball-hawking defenders, and it doesn't help that VT defensive coordinator Bud Foster is known for bringing pressure on opposing defenses with exotic blitzes. Depending on what happens with the passing attack, the Razorbacks could lean heavily on their ground game. That ground game is helped by a deep stable of backs, namely Rawleigh Williams III (1,326 yards) and Devwah Whaley. Yet, that rushing attack will not have any success if the offensive line struggles. Arkansas has plenty of bulk and experience in that group, but inconsistency has been an issue. If the group can't stop Virginia Tech's aggressive attacks, the Razorbacks are going to struggle. This should be another competitive bowl that could either be high-scoring or a close, physical, low-scoring affair. My bet is on the Hokies and Evans to lead the charge, particularly if the defense helps out quite a bit. What a year it has been in Boulder, Colorado. After years of struggling in the Big 12 and Pac-12, Colorado is back playing in the postseason for the first time since 2007. They are hoping to end their resurgent campaign by taking down a tough Oklahoma State team. The Buffaloes' major improvement has hinged heavily on a dangerous offense. 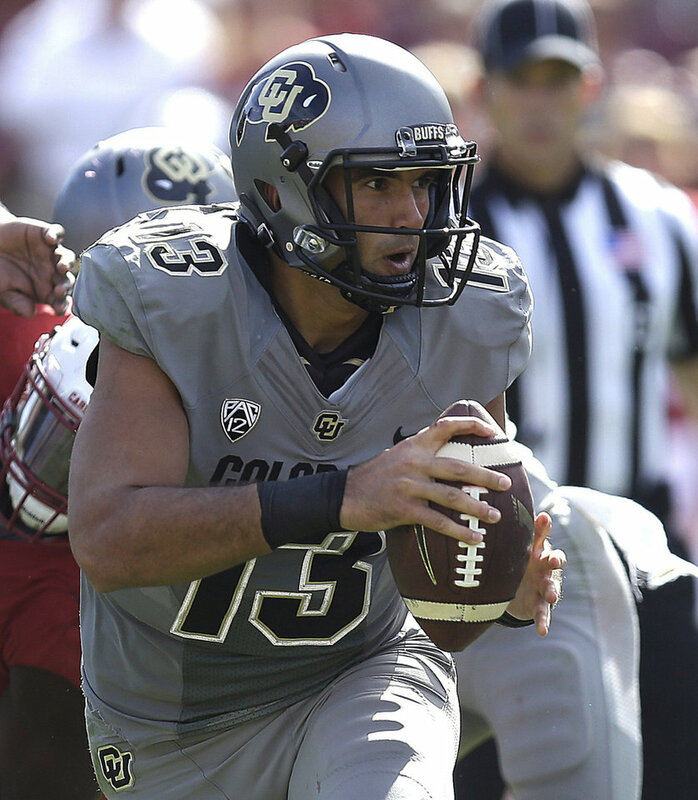 Senior QB Sefo Liufau has not been 100 percent for much of the year, but has still played extremely well. The dual threat can make all the reads, and extends plays in a variety of ways. He will be aided by underrated running back Phillip Lindsay, who is deadly in the open field. Playing in the Big 12, Oklahoma State fits the stereotype of teams from that conference that can light up the scoreboard, but struggle to stop anyone. Not having pass rusher Emmanuel Ogbah, who left for the NFL last year, has only hurt the Cowboys' defense. The group must put pressure on Liufau and make tackles in open space, which has not been a strength for them this season. If this game does turn into a shootout, Ok. State should be in pretty good hands. Junior Mason Rudolph has proven he can burn defenses with his huge arm, and wide frame. Rudolph and his favorite receiver James Washington Jr. (both have announced they are returning in 2017), will look to have success against a Colorado secondary that has been great all season long. The Cowboys rushing attack has lagged behind over the years, but the group does have explosive Justice Hill, who ran for over 1,000 yards. Hill is small, but runs extremely hard, so Colorado tacklers must be prepared to fight against his tenacity. The Buffaloes don't have a ton of big name stars on their defense, but their front seven has plenty of size and experience, so this should be a great battle between the two. Also important is the motivation factor: Oklahoma State is angry, as they are coming off a loss to bitter rival Oklahoma and could have been in the Playoff mix if not for a fluke loss to Central Michigan, while Colorado is trying to rinse the bad taste out of their mouth following a bad loss to Washington in the Pac-12 Championship Game. This game should have plenty of points, and could also be a toss-up. However, I like the Buffaloes to win this one and end their big year in a big way. They have more experience and proven playmakers on defense, which should be enough to help them secure this one.